The first time I saw our kitchen- I fell in love. Not with the dust bunnies, old linoleum or that ceiling fan with the beer bottle pull. I fell in love with the cupboards. Those cupboards that were original pine that were covered in 5 layers of white paint and that reached all the way up to the ceiling. With the drawers that drop when you open them and the door by the sink that won't stay closed. They are far from perfect- but they are original and I absolutely love them. 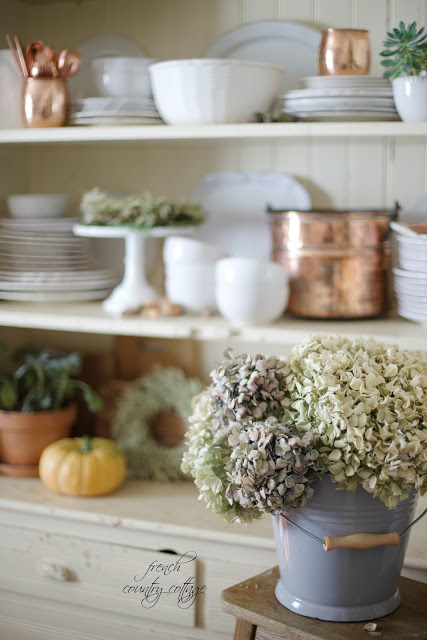 For me- a vintage home is one that has my heart. I love all that charming character from years gone by and that those older homes tell stories of all that has happened. The birthday parties in the backyard, the laughter through the halls and all those moments that happened there. But not all kitchens come with a vintage pedigree - and they are just as charming and beautiful. One of the questions I am asked often is how do you add that vintage charm if you have a brand new space. And so, this year, I am going to tackle those questions and share some of what I like to do to bring in a bit of that charm of yesteryear. I am not talking about big renovations - I am talking about easy ideas that you can do right now. And today it is all about the kitchen. Simple and easy to do- breadboards are a great way to bring in texture and add a bit of rustic charm. I love to stack tall ones together against the wall- and smaller ones on the counter underneath the cupboards for a bit of interest. Mix vintage and new- and some of my favorites are the chubby ones that layer with a bit of oomph. 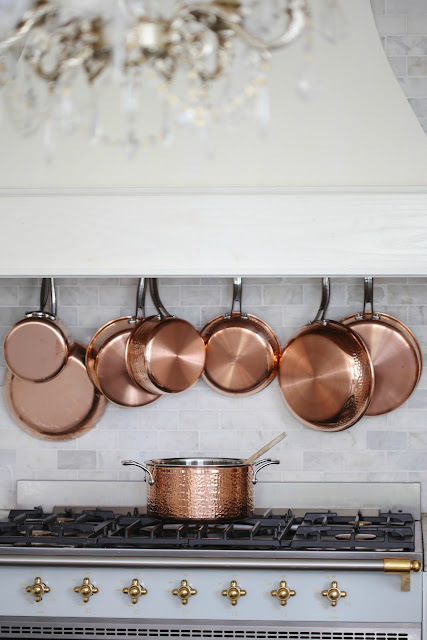 Copper is just always a good thing in the kitchen, right? That bit of gleam and warmth it has- it is a perfect accent. 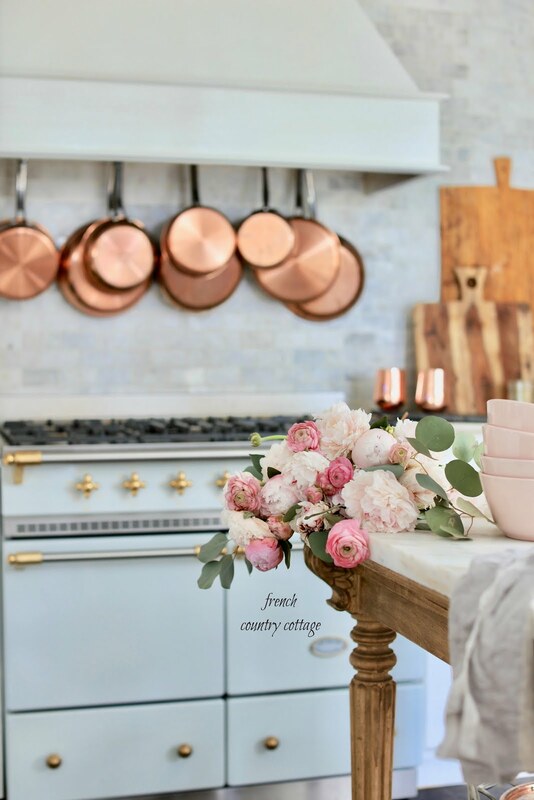 You can find copper at thrift stores, flea markets- and brand new copper at places like HomeGoods. Hang them together at varying heights for a bit of interest. 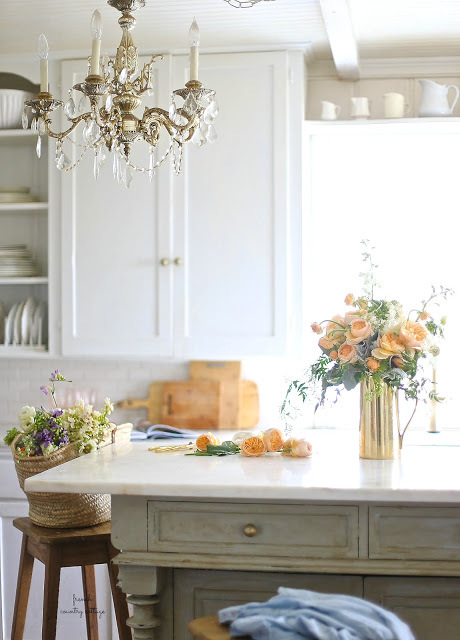 Our new kitchen island has all the charm of a piece that is 200 years old- but it has a secret- and I will be sharing all the details about it next week. But think of something with character- like a vintage table or dresser to be used as an island. 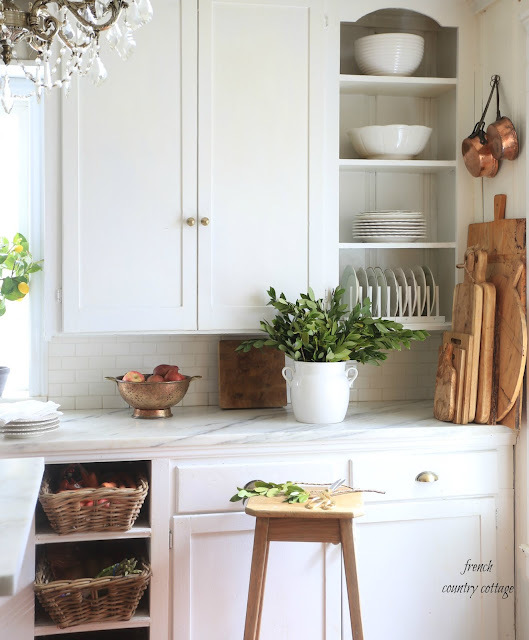 Something old brings a whole lot of charm and character to new space instantly. I always say a room isn't truly finished with out a chandelier and fresh flowers. And that is true even in the kitchen. I found this vintage chandelier in a second hand shop back.in.the.day and was thrilled to find a matching one a couple years later. My husband may have rolled his eyes at me when I told him where I wanted to put it- but once it was up in the kitchen-it was perfect. Or delicate china. Or vintage silver. Or anything that speaks to you. 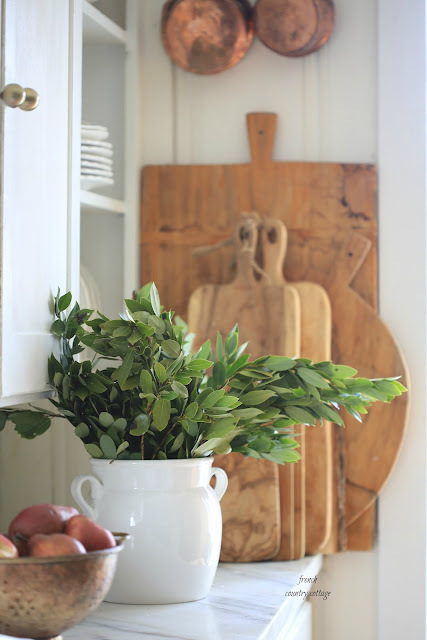 I am a big white dishes kind of girl- so ironstone tends to come home with me often- but go with what speaks to you. Group pieces together with a high and low look for interest. 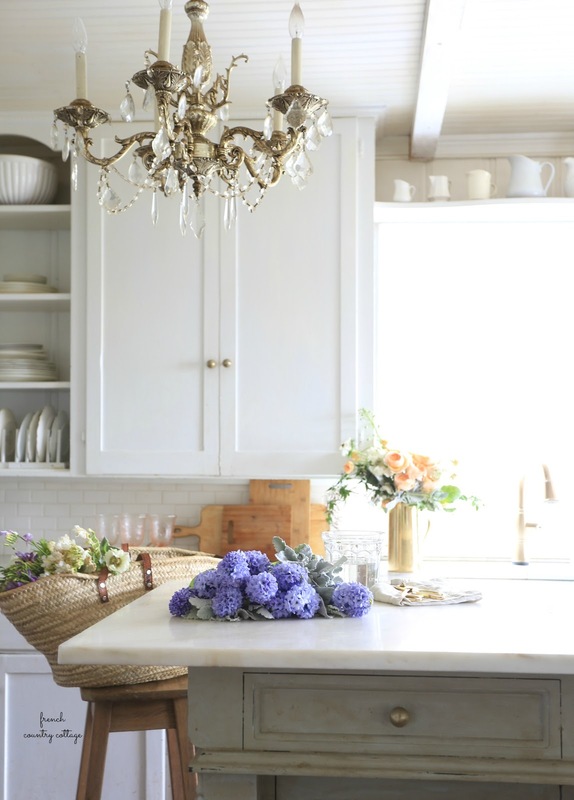 There are so many ways you can bring vintage charm to your kitchen and it doesn't have to be expensive or hard to do. Your style feeds my soul. Perfection. Absolutely gorgeous - the photos make my heart happy ! My thoughts were just about like your husbands when my daughter called one day to say she had found a chandelier at a junk yard sale. And like you...hers is in the kitchen...It looks great. I love those breadboards. I'm looking forward to your VINTAGE HOME ideas. I have been on the look-out for an island for my kitchen and the ones I see are cheap looking. I have thought of incorporating a piece of furniture in the kitchen to utilize as an island, will know when I find the right piece. Looking forward to your blog on this next week! Of course I just love your kitchen...it is very similar to mine that we are in the process of renovating! Question for you-- do you have one or two islands in your kitchen? (unless you made a change) thank you!